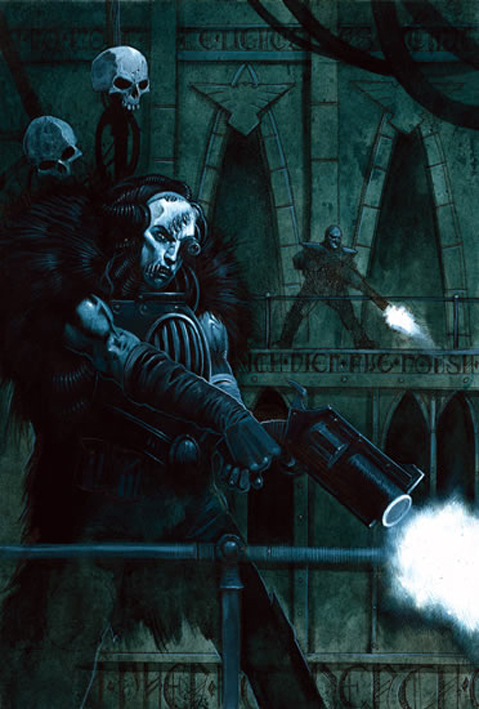 The truth is that finishing my Ordo Scriptorum Inquisitor really led to yet another surge of inspiration, as I kept trawling the internet for more Wayne England illustrations from around the same time period. Unfortunately, his work seems to be much less well documented than, say, John Blanche’s, and many images were only available via that abominable hellpit called Pinterest. 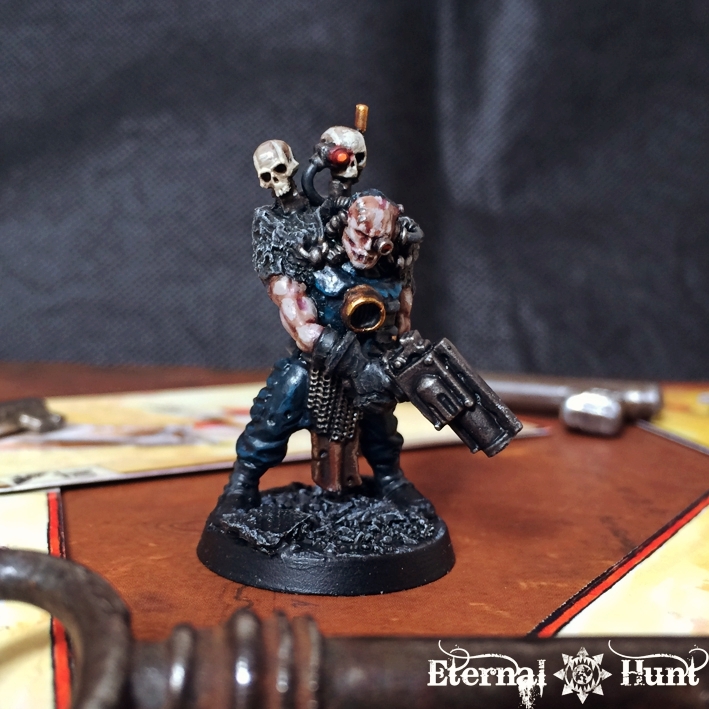 When all is said and done, it’s a pretty straightforward kitbash, mainly using parts from the Dark Vengeance chaos cultists: In fact, the entire conversion really took off to begin with once I realised the creepy cultist head with its mouth stapled shut resembled the head of the ganger in the artwork. 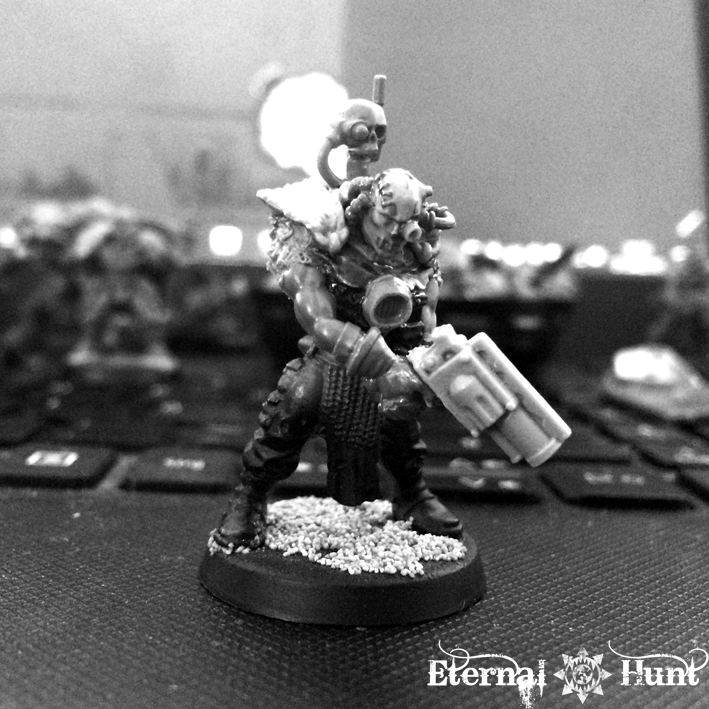 Beyond that, it was mostly about trying to get the subtle things right: the way the cultist is holding the gun in two hands was the key part, and I was lucky enough to still have an ancient Gorkamorka shoota that almost perfectly matched the design of the stub gun in the artwork. 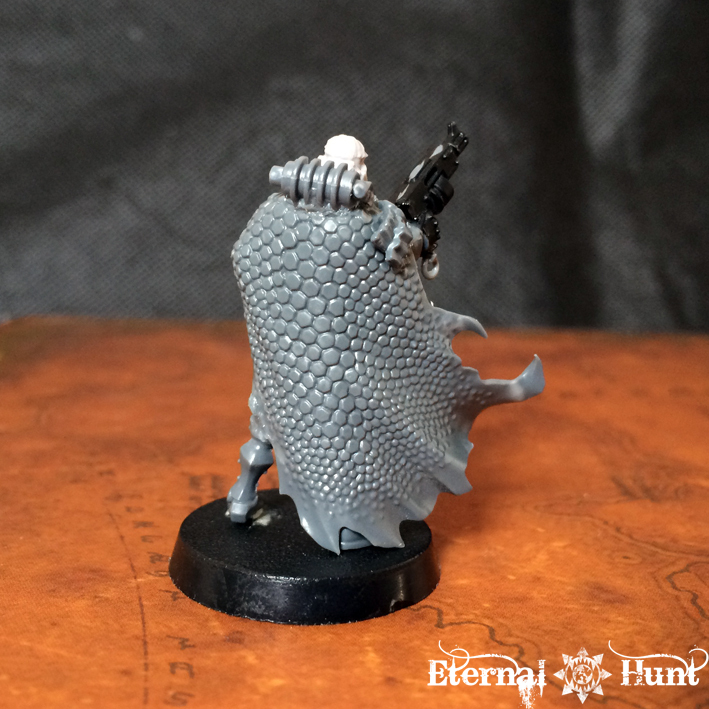 I also wanted to include the weirdly-glamrock fur collar, so I used the upper half of a Chaos Marauder cape as a starting point and sculpted some rough GS fur around it to suitably blend it in. 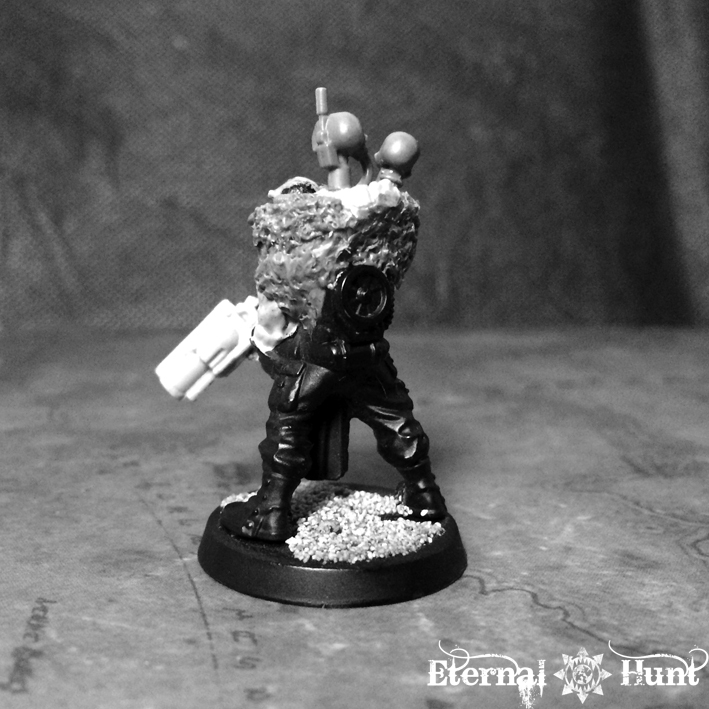 I also decide to depart from the artwork in one specific way: Much as I love the piece, the angle of the head makes it clear that the ganger is aiming (and firing) downwards, which is something I did not neccessarily want to reproduce on my model, mostly because it would look kind of silly when the model’s standing on the floor and not in an elevated position. 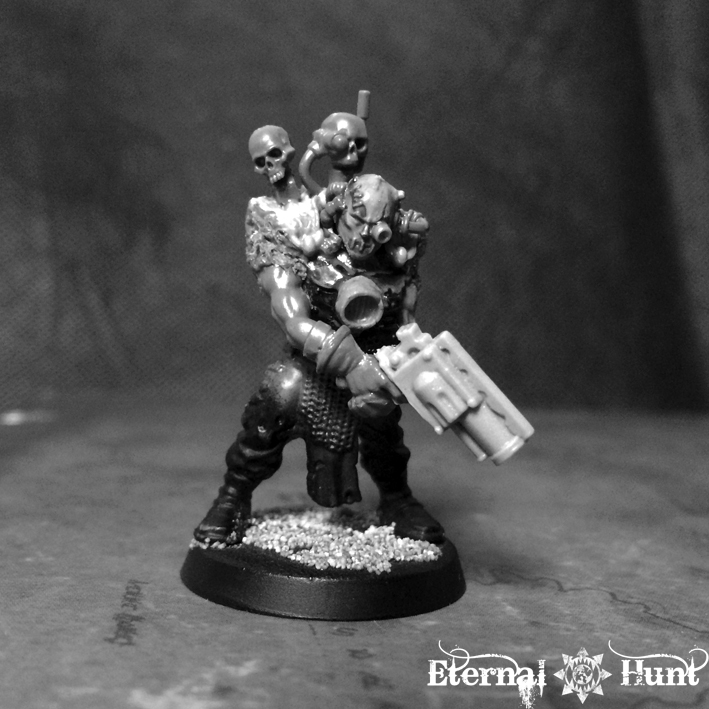 So I tweaked the angle of the head a bit to make it look more as though the ganger were standing wit the gun at rest. I actually think the angle I have chosen makes the guy seem slightly more sinister, but that’s a matter of personal preference, of course. Bureacultists are former members of the Administratum whose archive or bibliocathedra has been sealed off or forgotten. 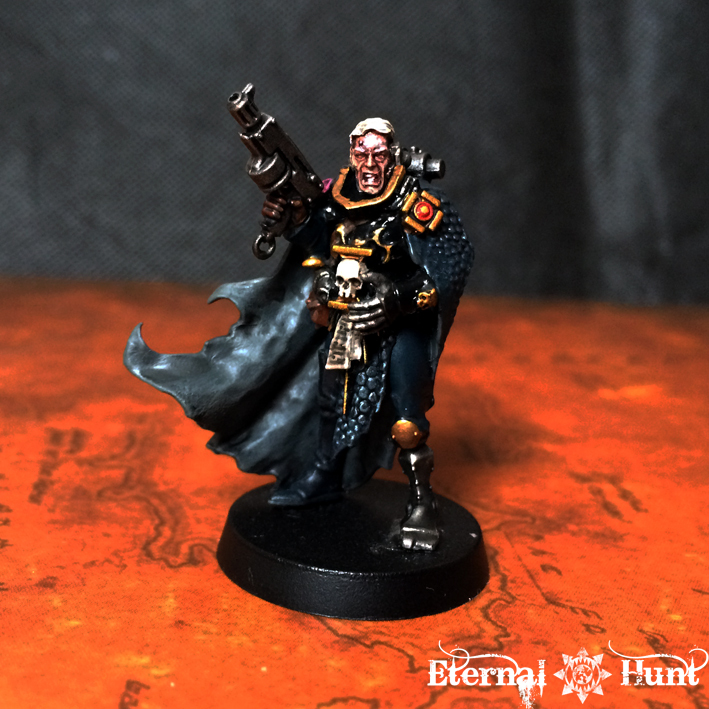 They keep doing their job of accumulating and organising data, yet without the rest of the Imperium taking any notice, they grow more and more isolated and feral as years, decades or even centuries pass. Now just to give credit where credit is due, the Bureaucultist idea wasn’t really mine, originally, but rather came from the excellent fan-made Dark Magenta article on Holy Terra as an adventurescape. manage an extensive library or private archive. Bureaucultist slave labour of the Ordo Scriptorum. These workers are indentured by the threat of redaction and the deletion of generations worth of bilbliocatherdra, data vaults and knowledge. 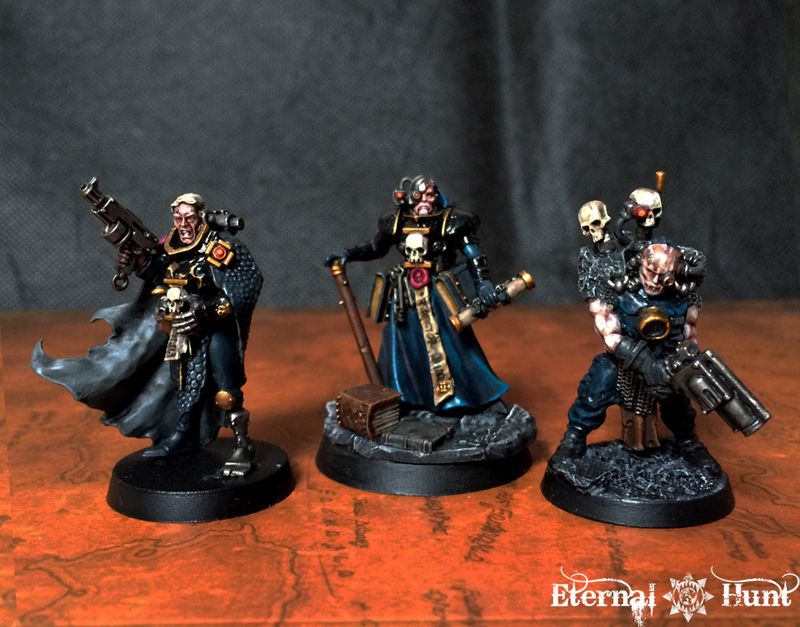 While these repositories are often worthless to the Imperium, the threat binds the cultists to the Ordo Scriptorum, making for the most loyal of slaves. 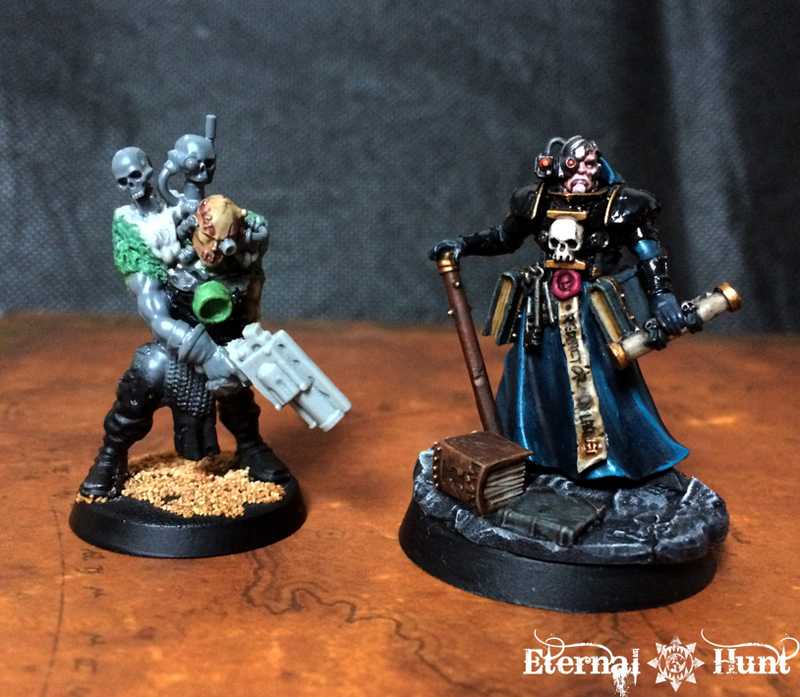 So while the ganger in Wayne England’s illustration above probably wasn’t planned with the bureaucultist angle in mind, I still thought it might be a cool idea to use the converted character as a bureaucultist. 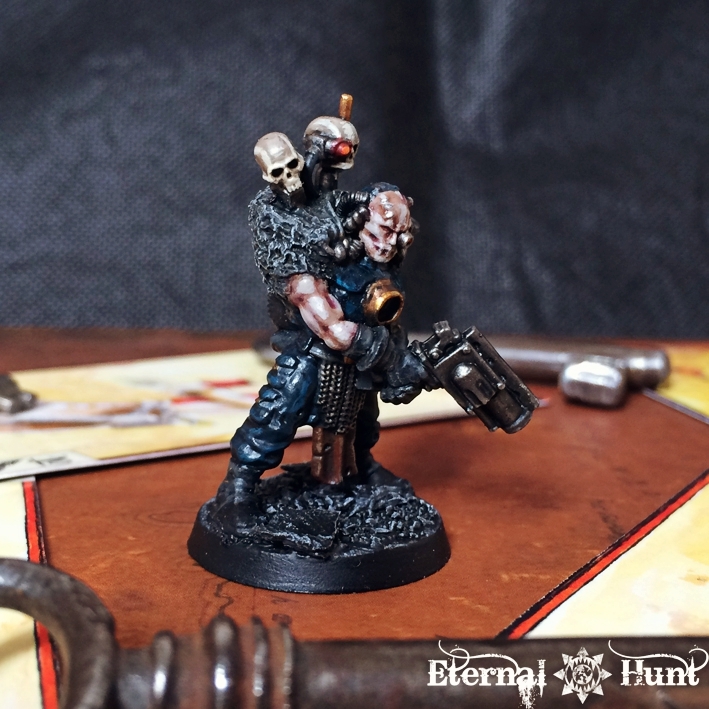 There are even some touches that might point to the idea of a librarian gone feral (such as the servo-skull banner pole — a trophy or a legitimate way of storing data, even after all this time…?). I wanted to create a really strong resemblance while also clearly communicating the fact that my version actually shows Inson as a (slightly) younger man. 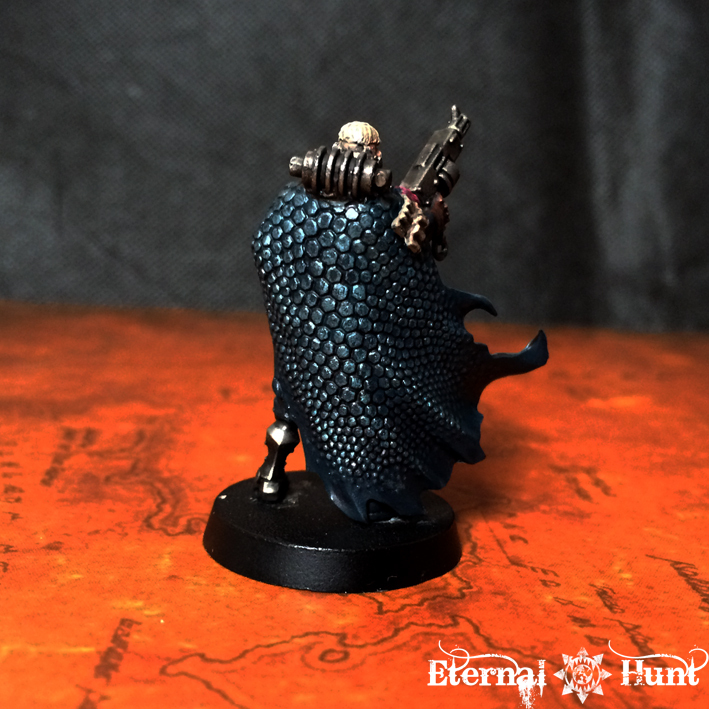 At the same time, I also tried to add some cues that pointed back at Orlant (such as the collar, that is actually virtually identical to the one used on Orlant, while also looking like a less exalted version of older Inson’s “jaws collar”, or the Inquisitorial symbol added to the model’s breastplate). 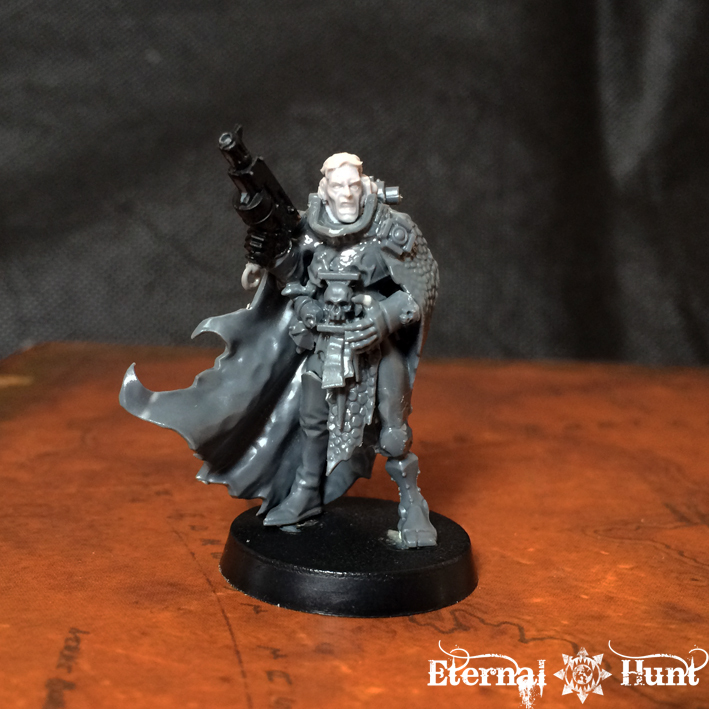 But then PDH informed me that his background character featured pretty specific information about where and when Inson had lost his leg, and was already rocking an augmetic replacement by the time he became an Interrogator in the Ordo Scriptorum. 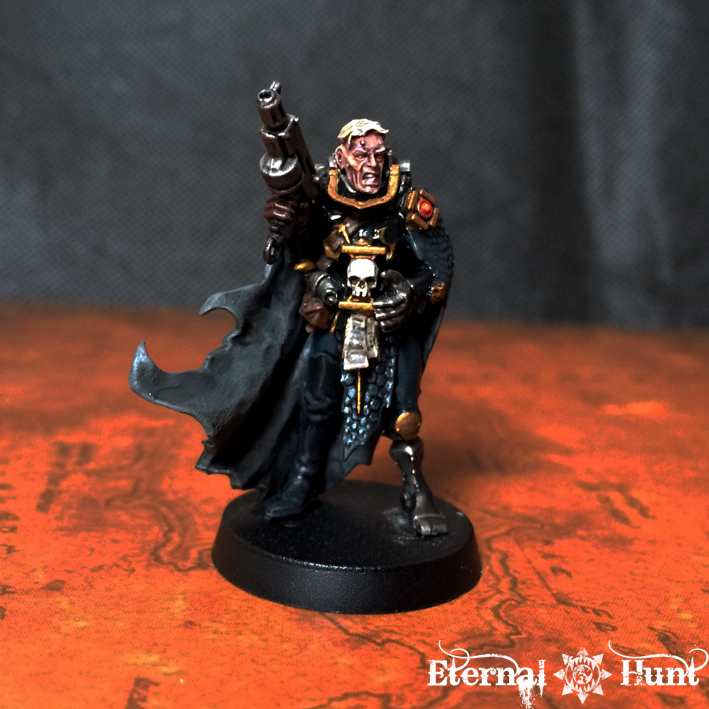 By the same token, his bolt pistol was confiscated by the Arbites when he first set foot on Terra, and was only given back to him after he obtained his full Inquisitorial rosette. While my version of Inson is a bit younger, Peter’s background for Inson characterises him as a pretty conflicted individual even at this earlier point in his career, plus there’s also the physical trauma he incurred during his work as an Ordo Xenos Inquisitor, so I went for a somewhat drawn, unhealthy look for the face, which I think has worked out pretty well. 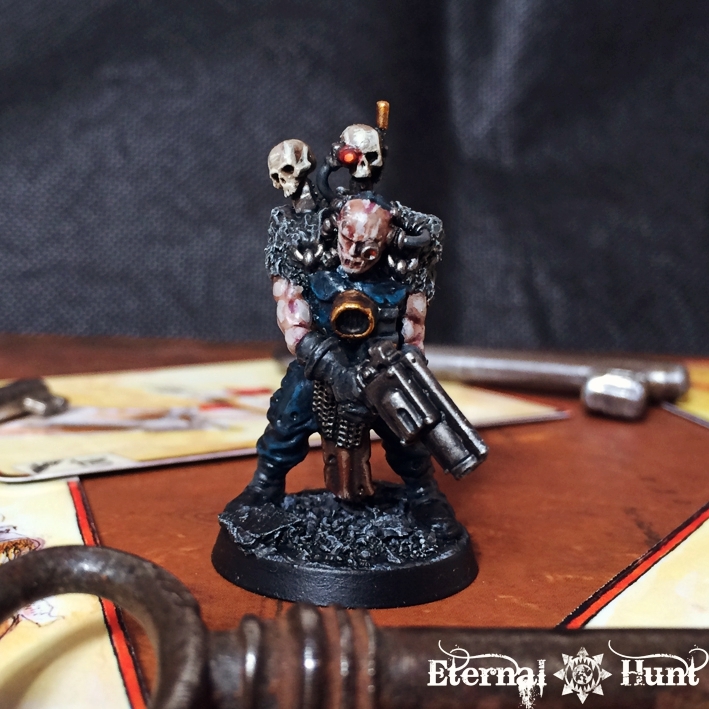 This entry was posted on April 16, 2018 at 14:00 and is filed under 40k, Conversions, Inq28, Inquisitor, paintjob, WIP with tags 40k, Assembly April, background, bureaucultist, community challenge, conversion, cultist, fluff, INQ28, Inquisimunda, inquisition, inquisitor, Inquisitor Orlant, interrogator, kitbash, klien inson, ordo scriptorum, paintjob, PDH, Redactor Orlant, wayne england, WIP. You can follow any responses to this entry through the RSS 2.0 feed. You can leave a response, or trackback from your own site. 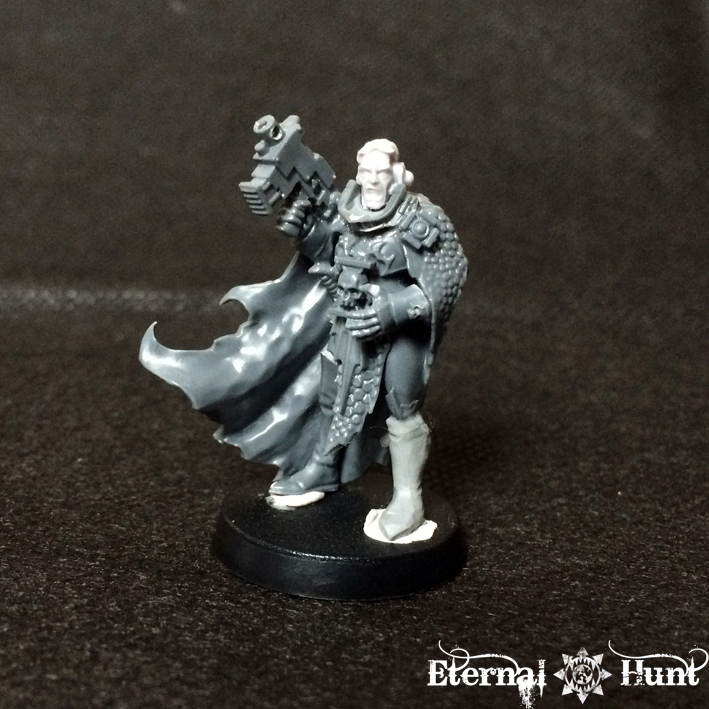 Its pretty amazing how well you represented that bureaucultist, i have 10 cultists on the sprue frim Dark vengeance, i was thinking about having some/all of them intoombed and wailing inside the arnour plating of my Thousand Sons baneblade but maybe Inquisatorial henchmen is the way to go. I also enjoyed the process of creating thebyounger version of an existing character, only having to change it partway through tonremain canon. 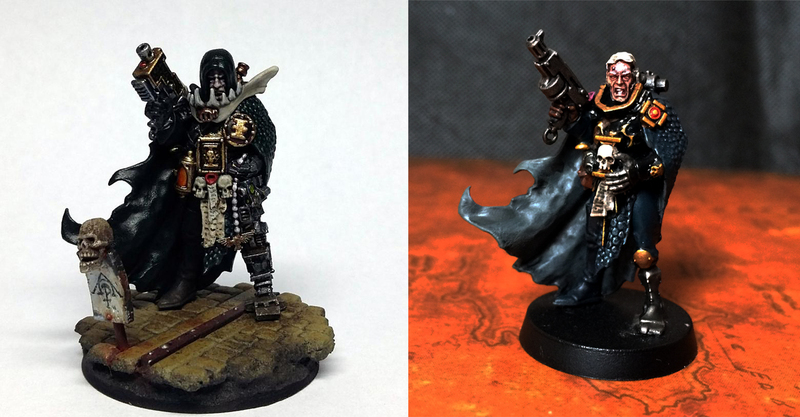 Your work is incredibly insparational and in adition to wanting to decelope my inquisition im thinking about starting a small Deathwatch contingent, fully converted and customised. Thanks again for sharing Krautscientist. I love the idea of characters at different times, like your Angrons or even alternate timelines. 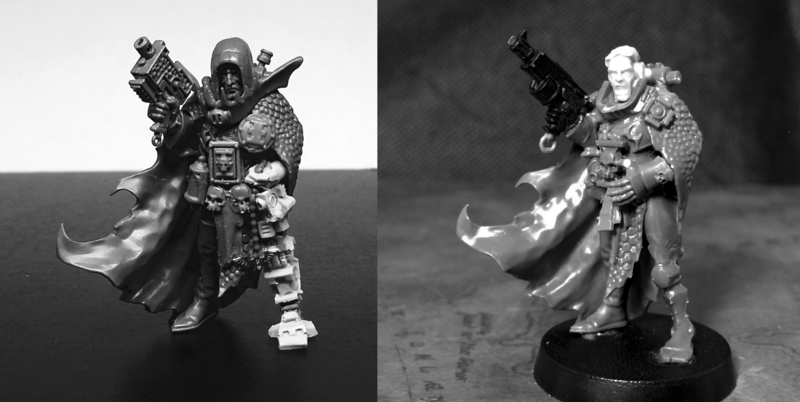 Krakendoomcool showed me a model someone converted of a Ferrus Mannus with a flaming sword (https://apologentsia.blogspot.co.uk/2016/07/inload-ferrus-manus-conversion-and.html?m=1), then im thinking what if ferrus survived, killed fulgrim and too his sword instead? 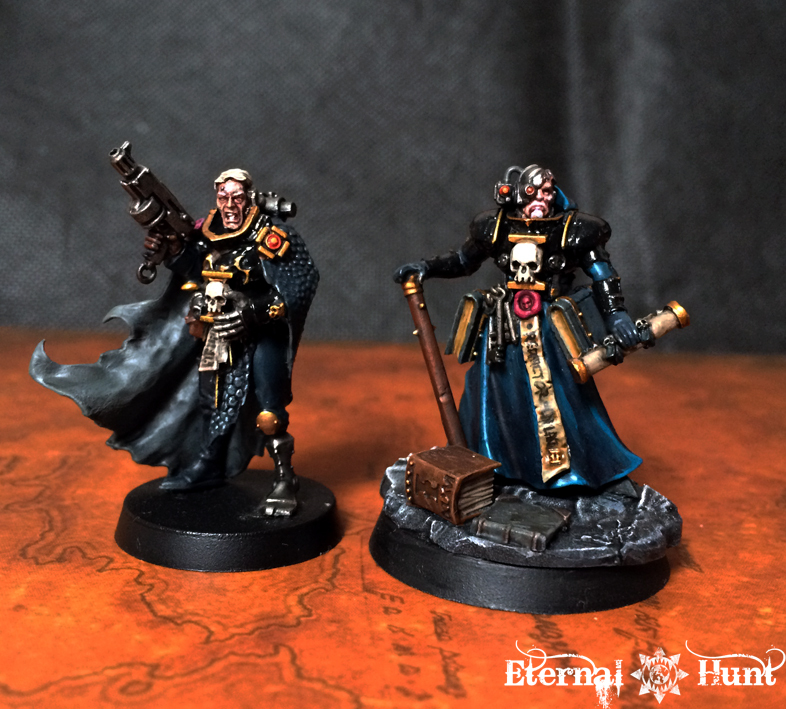 Then my brain goes to… What would Ferrus’s relationship with the admech be like, how would that impact the equipment of iron hands in the 41st millenium. 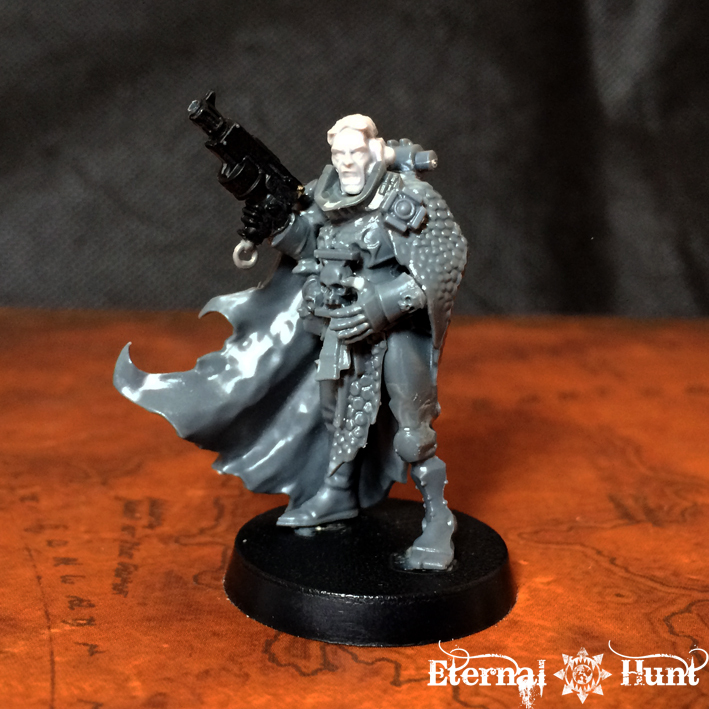 Further, what if different primarchs died/survived/turned to chaos? A Khornate Russ, a slannesh Sanguinius, Nurgle Vulkan and Tzeentch Guilliman? I love these concepts. What if the emperor wasnt mortally wounded but crippled, and traveled around on a throne like inquisitor Karamazov? I wish i had the time and resources to build some of these ideas. Maybe in time. But yeah… Sorry, that was like a very long winded way of saying i liked your idea, just got carried away! 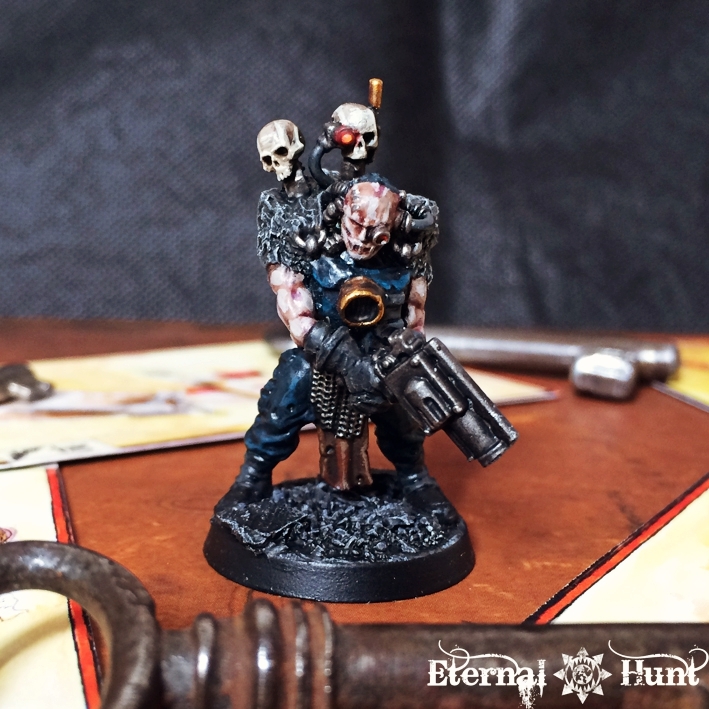 Well, if those ‘what if’ scenarios interest you, you simply have to check out the “Dornian Heresy” subforum over at The Bolter & Chainsword. 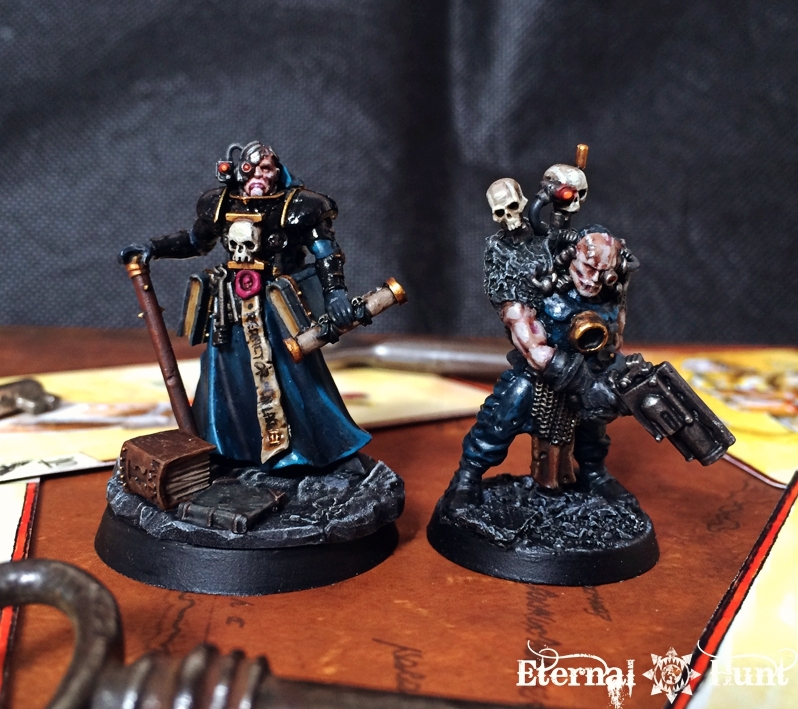 It hasn’t been updated in ages, unfortunately, but I still think it came up with the best alternate 40k history I’ve seen so far. Actually, anything based on Wayne’s art is really cool. I am currently painting something Wayne England based on my Knight. It is always great to get back to the work of this amazing artist. Thanks a lot, Maxime! It’s always an honour to hear from you! 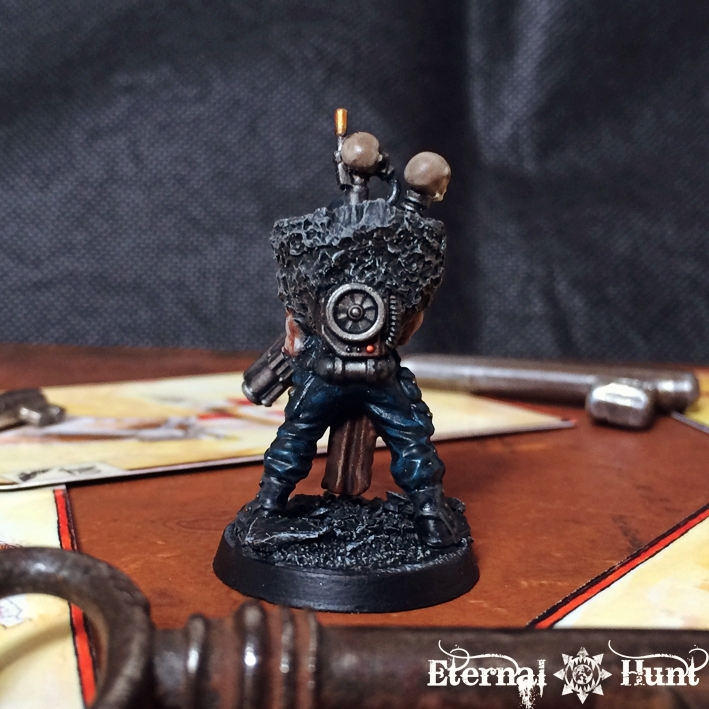 Absolutely in love with the bureacultist, from the background (thanks to all who refined the idea, of course) to the miniature and painting! Two great models, mate. You’re really getting a knack for capturing England’s work. Personally I’d have gone with having him aiming down the gun (he could be blasting cockroaches on the library floor!) but in your colour shifted photo the pose matches the artwork pretty well anyway. I’ve actually got a photo of PDH’s Inson in my ‘inspiration’ folder but I’d no idea who it was from, so that’s cleared up that mystery. You’ve got the makings of a(nother) very characterful warband there. 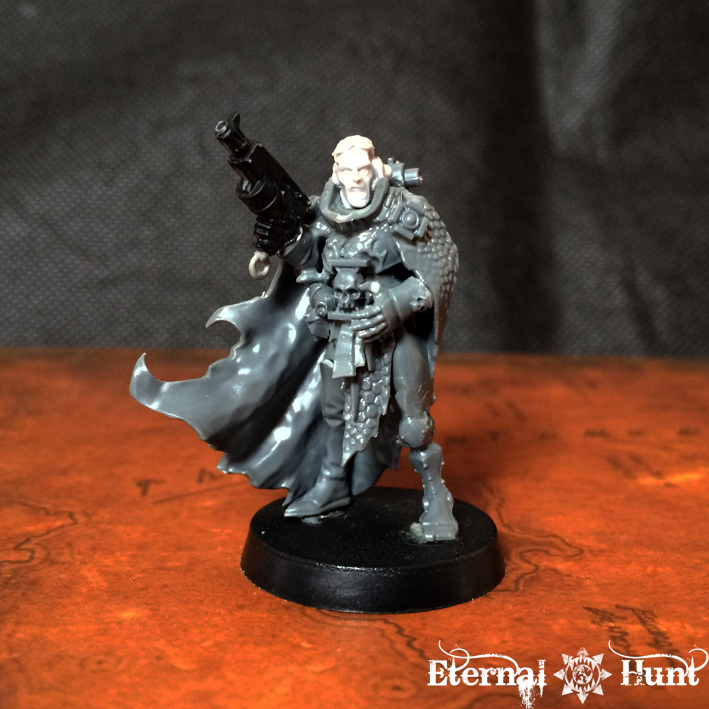 Looking forward to seeing how you tackle the psyker! 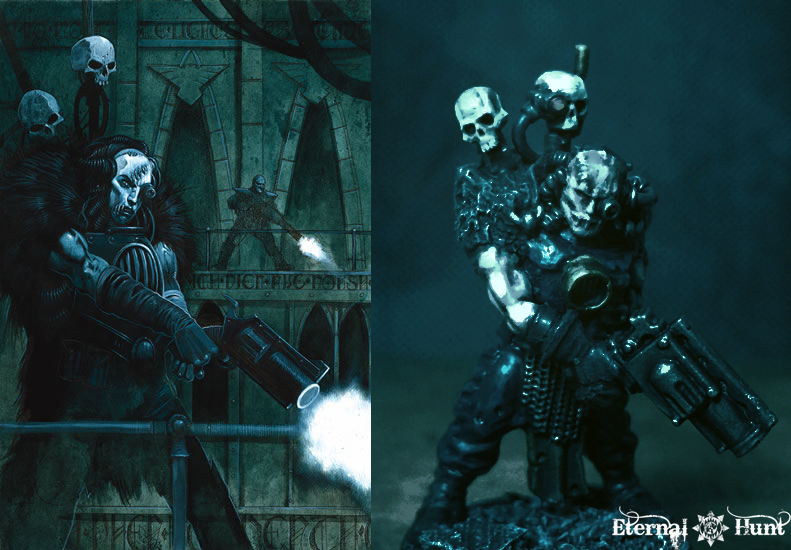 Another two fantastic builds, not to mention the paint which captures the dark atmosphere of the artwok’s palette, even in the full-colour versions.